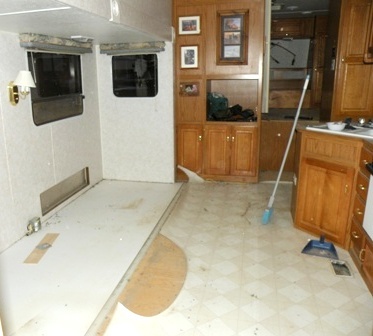 Let's Do Some RV Remodeling Demolition! RV Remodeling Demolition for an RV Extreme Home Makeover! :-) The first step in this winters project to custom tailor our Rig to our own way of going. The Only difference here is that the rig wasn't falling apart decrepit... it just wasn't 'quite' what we've come to want. We could have spent a huge amount to gain a NEW rig... but the truth is we liked most of our existing rig. Not to mention the miles of good memories carried on this Ol' Jayco. So... with some changes to the inside of the rig, by way of an RV Renovation... we'll be Golden! Doing this RV Remodel, RV Renovation or RV Makeover... whatever you want to call it, is by far the lowest cost, most Frugal RVing route to take... and the shortest way I know of that takes you to a rig, custom tailored to your idea of what your rig should be. So now... On to the RV Remodeling Demolition of the existing RV Interior. 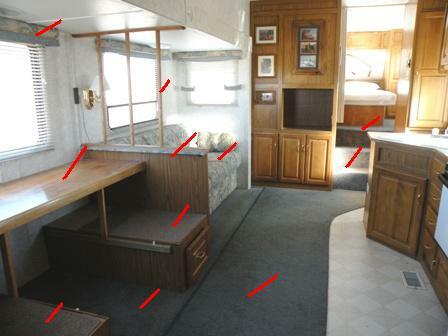 In the following picture I have marked the parts that are to be removed in the RV Remodeling Demolition phase, of this winters RV Remodeling project, with a red hash mark. First to come out will be the desk I replaced the dinette with a couple of years ago. Under it are the old benches from the factory dinette... Out they come! Next to be removed will be the original jack-knife couch. and then the low, 'kick-wall, and the spindles above, now separating the couch and desk. Up in the fifth wheel bedroom area, removed during this RV remodeling demolition will be the RV bed base compartments I also built just a couple of years ago. They'll only come out temporarily. I'll reinstall them as soon as the new flooring has been laid. Under all that furniture is the carpeting and its' padding... which is going to be replaced with Allure, vinyl flooring. 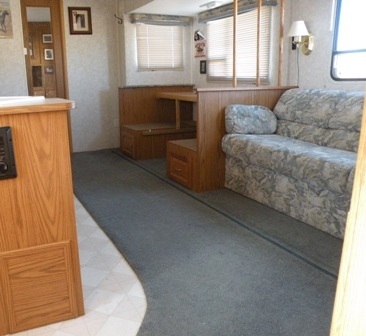 As I remove the carpeting I'll also tear out the stairs, that lead up into the fifth wheel bedroom, so I can rebuild them as storage compartments. The two easiest parts to remove, were the Desk and the couch... a few screws... a couple thumps on stuck parts... and zip dee doo da... gone! Taking out the spindle section, the screws were concealed by small wood plugs. To keep from destroying the surroundingwoodwork ( you never know when you might want to recycle some part) I simply ran a drywall screw into each plug afew turns... then popped it out with a carpenters hammer. Then, same with the Bed... a few screws... a pry here and there and out it came... Leaving the carpet exposed for my attack.. Most of 'em do things in almost a modular series of steps... in this case... the flooring goes on... and then cabinets and walls... Bottom line?... 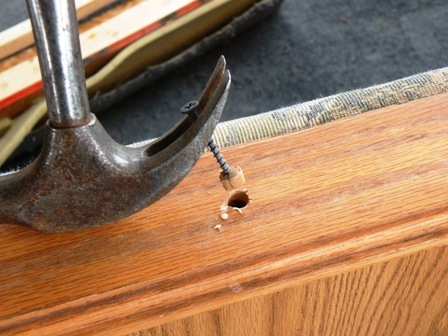 a goodly part of the carpet is captured, under cabinets and walls... so it has to be cut and torn loose. Not neat... but it comes out. and that boys and girls is why they call it RV remodeling demolition... 'cause sometimes you just got to get athletic... and demolish it! ... and reveal a huge amount of dirt! Yuck! It was almost embarrassing. But here's the thing. We've run an extraction type cleaner over this carpet a couple of times a year since we've had it... We've cleaned the sucker... and it was still filthy... so... You've got a $500,000 Motorhome? 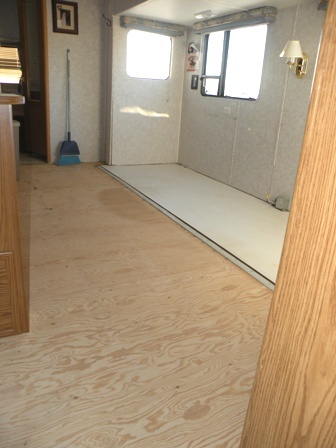 So... if you have any sort of 'dust' allergies... or respiratory problems... swapping out your RV Carpet for some variety of hard flooring, like we're doing is probably money well spent. Leastways if you like Breathing! 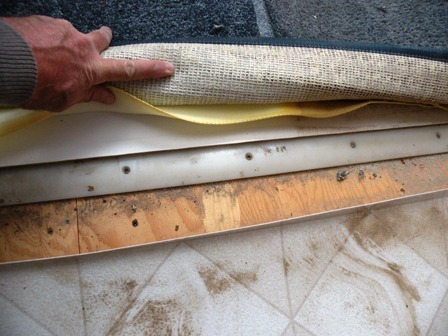 When I first started working on this RV remodeling demolition, I'd planned on leaving the carpet intact, in the slide area. Along the inboard side of the Slide is a nylon piece I call a "Bearing Bar"
Its purpose is to lift the slide floor and carry it up over the interior flooring. The problem is, a flap of the carpet in the slide covers it when the slide is extended. 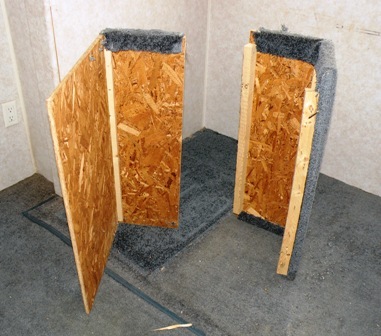 Remove that carpet, and with the slide extended there'd be that bar laying there exposed. Not especially attractive. So... most folks just leave the carpet in the slide and be done with it.. They make pieces called Transition Strips, for those places in homes where you have to transition between carpet and tile or carpet and linoleum or even wood to tile... The things come in a variety of configurations, and I believe I've spotted one that will work for my needs... we'll see once I get to the flooring installation... so check back! The only place I needed another set of hands was to wiggle that old jack-knife couch out of the rig. Heidi helped with that... otherwise I've been left to my own devices to do the RV remodeling demolition rippin' an' tearin'. And now... 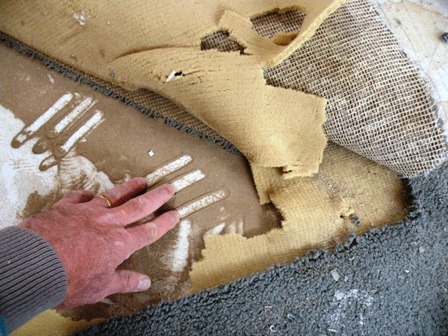 The "Rest of the RV Remodeling Demolition story"
As in all RV Remodeling demolition projects... as you work, you're likely to uncover unexpected things that will require some attention. When I got to the stairs leading up into the bedroom, I'd been figuring on just pulling the stair treads loose, and replacing them with Hinged Treads/lids, easily converting them to storage compartments, once the carpet came off. When I tore the carpet loose, the rather flimsy stair assembly pretty much disintegrated... Just chip board and staples flopping around. The RV Carpet itself was a big part of what was holding them together. ... So I'll need to fabricate a complete new storage bin unit, that will also do double duty as the stairs up to the RV bedroom. 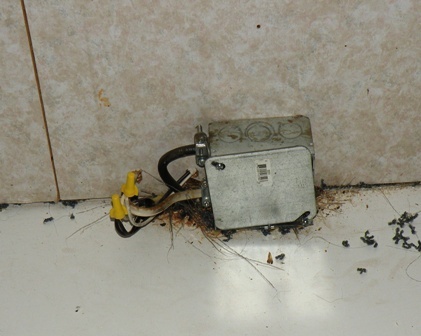 also, an electrical box was exposed that lay under the couch. It's just plain ugly... and ... why did they bother to put in a junction box... and then do 1/2 of the splices... outside the box? really well done! :-) ... I'll redo that lil' bit there to clean it up. The carpet itself was, as is common, layed over the vinyl flooring. The general rule is, when you lay the new, 'Floating' vinyl flooring, you just drop it over the existing, old, vinyl... Not gonna happen this time. In the area in front of where the desk/dinette was... you can easily see how the old vinyl had a big, semi circular cut out of it... combined with how it wants to curl along that slide bearing bar... I just don't like the look of it, and know that leaving such a sloppy underlay is gonna irritate me for a long time... so... that old vinyl flooring came out too! With the RV Remodeling Demolition pretty much done I can start in on the fun part... installing all the improvements and upgrades... Like Building the New Storage Stair Unit!